So its pretty much what the title says. I start up a few old games I got they go fullscreen and shortly after they are minimized into a window on the desktop. When I disable Fences this does not happen. But when I enable it again it starts up again. Sorry to hear you are having issues. Never have this report from others. Need more details. 1) Windows version, use Winver.exe for full version numbers. 3) Problem on all games or just certain games. 4) Games get minimize randomly. Or instantly after start or certain key press. Need more information on this. A video grab of the issue happening will be best. 5) Monitor setting. Single, dual or more monitors. Resolution on each monitor and scaling applied if any. The games i've tried use dgvoodoo2. It will force a game resolution from 640x480 into 1920x1080. So what happens is a game will load at 640x480 and quickly change to 1920x1080. The problem I'm seeing is that Fences has to sort icons on the desktop during a resolution change. When this happens for certain games they will minimize while Fences is auto sorting the desktop. Thank you for your input. I have forwarded your problem to Stardock Support team for their assistance. Please keep an eye on this thread for any updates. We appreciate your feedback and patience. I figured out how to fix this problem. 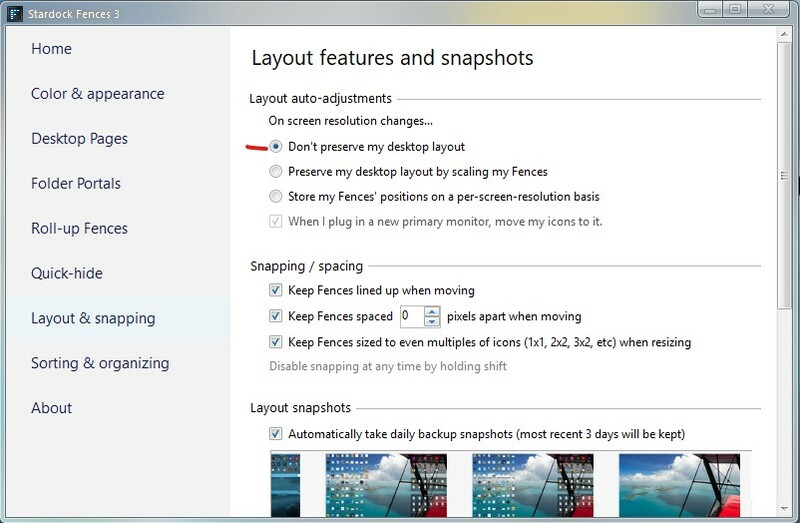 I have to go to Fences Setting and go to layout & snapping and don't preserve my desktop layout. That has seemed to solve the problem.